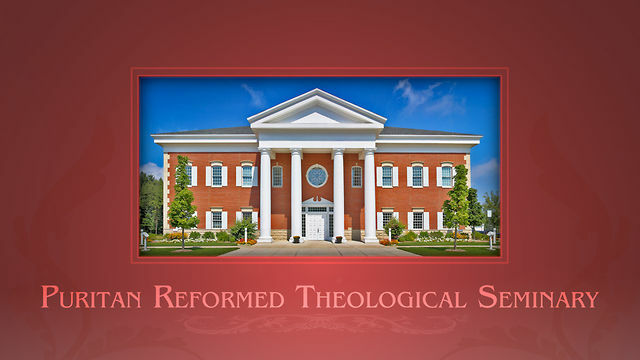 The Commission on Accrediting of the Association of Theological Schools (ATS) has granted Puritan Reformed Theological Seminary full accreditation for all three of the degrees we offer—the MA, MDiv, and ThM. We are grateful to God and for a team of hard-working faculty and staff, and pray that this accreditation may serve the seminary well as we strive to serve the worldwide church. Here is a short video on the Puritan art of godly meditation–a subject I feel strongly about. For more information on this subject, see chapter 55 of A Puritan Theology: Doctrine for Life. 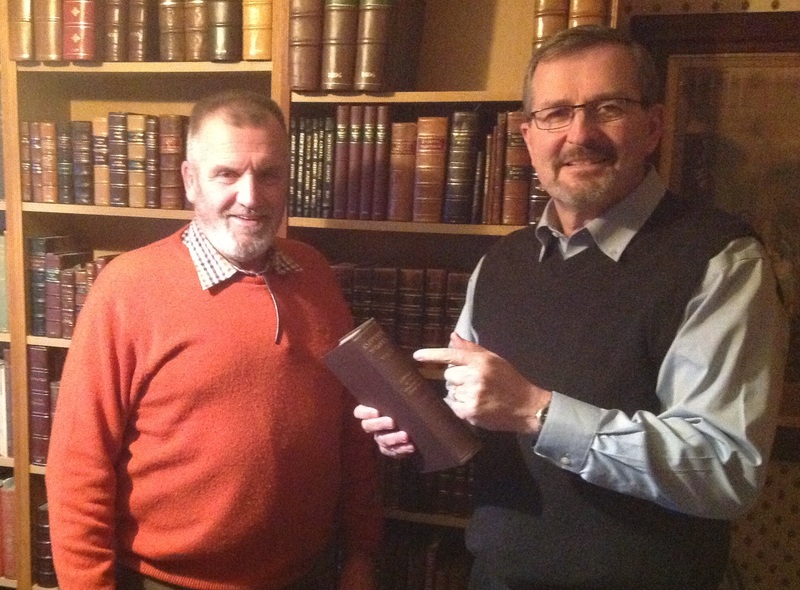 The KJV Study Bible Sample Edition Has Arrived! We are delighted to announce that the sample edition of the Study Bible has been printed, and is available for free. It contains the text, introductions, and notes to Hosea, Jonah, Ephesians, and the Epistles of John, along with three examples of the articles on Christian teachings. 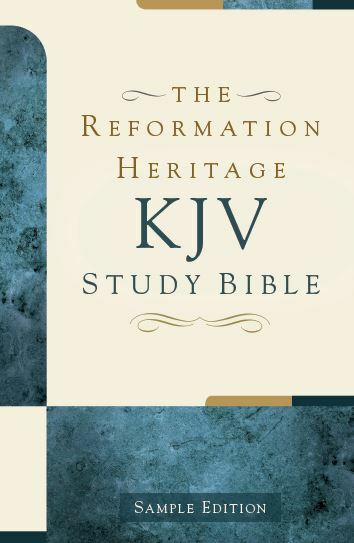 You may get a copy by visiting the bookstore of Reformation Heritage Books, or by downloading it from here: KJV Study Bible Sample Edition. Today was the last chemo treatment! My counts were the highest yet. We give thanks for all the answered prayers as my counts were very low last week. The treatment went well with no side effects. Afterwards I had a MUGA scan of my heart. I will get the results of that test next Monday when I meet with my oncologist again. So I have now finished chemo. I still have 14 Herceptin treatments left. (These are given at the cancer agency by IV once every three weeks.) I meet with my radiation oncologist on March 10 and then we will know exactly when I will be starting radiation. So we will send another update once we know more on that. We have felt really upheld these past 12 weeks. These last 12 rounds of chemo thankfully did not affect me too much. And I praise God for that as I have heard of many others who had worse problems with the Taxol chemo. So we are looking forward to a month or so “off” (with only a few Herceptin appointments and doctors’ appointments.) and are praying that the radiation will go smoothly when it starts in April. God has answered many prayers and His promises have been kept close to our hearts. “Fear thou not; for I am with thee: be not dismayed; for I am thy God: I will strengthen thee; yea, I will help thee; yea, I will uphold thee with the right hand of my righteousness” (Isa. 41:10). We thank you all again for your heartfelt prayers, cards, letters, emails, meals, babysitting, gift cards and anything else that people did for us. It has been a real blessing to be on the receiving end of so many gifts. I pray that all of you were blessed in giving as well. Reformation Heritage Books will be giving away a collection of over two dozen books worth $500. Enter your name by the end of Friday if you are interested. 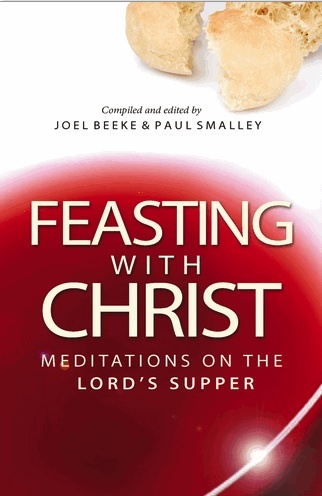 For those who are interested, this is the last opportunity to get the Logos edition of The Select Works of Joel Beeke (26 vols.) for the discounted pre-release price of $239.95. I am told that sometime today the Select Works will go live, and then the regular price will go up to $315.95 (the print books are $450). The conclusion of my trip to Northern Ireland was enjoyable. After church on Sunday, February 9, we overnighted with a delightful family, Julian and Hazel Orr, and their six children. Julian is a kitchen cabinet maker and has his shop on his home property in a beautiful area of Northern Ireland. Both he and his wife shared the stories of their conversions with us. On Monday morning, Mary and I took a walk in a large field behind the Orr home. Andrew Lucas then drove us to Erne West to enjoy the fellowship of John and Pearl Gowan—a place I never fail to visit when I come to Northern Ireland, due, no doubt, in part to the fact that Gowan’s bookshop (adjacent to his home) is one of the very best in the world for obtaining antiquarian Puritan books! After perusing the books for several hours, I preached from Philippians 1:21 for Rev. John McGee and brother Gowan that evening. Afterwards, I went back out to the bookstore and settled accounts with brother Gowan by midnight. In all, I found about half a dozen excellent antiquarian books for the Puritan Resource Center (which I took home with me in the suitcase), and one small box of more recent titles (which will be mailed). It was a thoroughly enjoyable time. 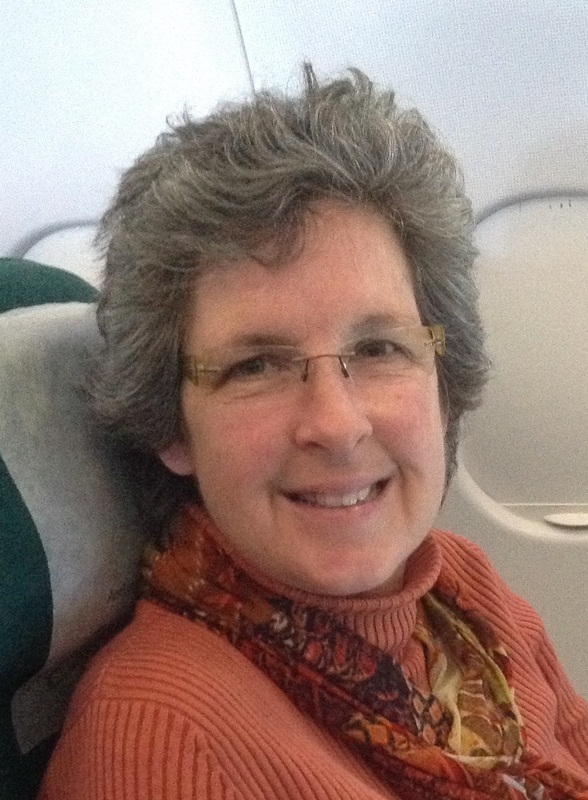 Flying Home with My Wife–What a Gift of God She Is! 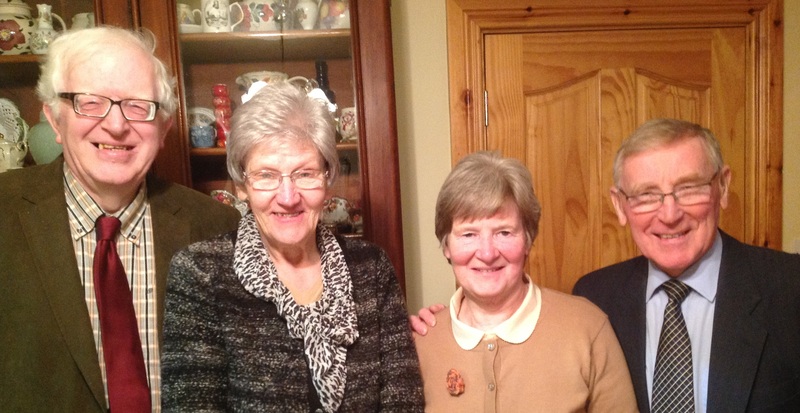 After overnighting with the Gowans and enjoying more fellowship with them and the Woolseys, Andrew and Joan drove us on Tuesday to the Dublin airport and we made the long trek home by late evening. Once again, we are most grateful to our faithful, covenant-keeping God for watching over with His kind hand of providence and benedictions. Thanks, too, dear friends, to all of you who prayed our way through this trip. Every blessing to you and yours in Christ Jesus. Friday morning I spoke at a fraternal for ministers, their wives, and church workers at the Mount Merrion Free Presbyterian Church in Belfast on “Maintaining a Healthy Devotional Life in the Ministry.” Mount Merrion FP is pastored by Rev. Paul Thompson. It was great to meet other familiar ministerial friends there, including Revs. Stanley Barnes, Alan Cairns, Ron Johnson, and Andrew Woolsey. 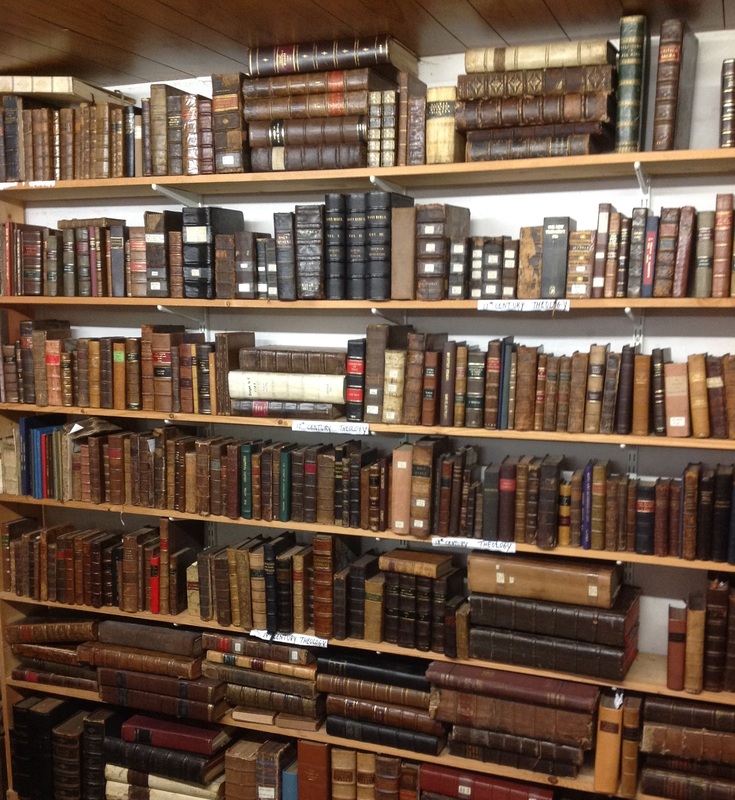 In the afternoon Mary and I visited Mr. and Mrs. Jimmy Murdoch and saw his antiquarian book collection. In the adjacent photograph, I am pointing to one of ten volumes by Thomas Smyth—a rare set of complete works by a remarkably able and prolific divine that I do not possess. I will be the first bidder if Jimmy decides to sell it! In the evening, we had dinner and wonderful fellowship at the home of Rev. Paul and Kay Thompson family (7 beautiful children), together with Rev. 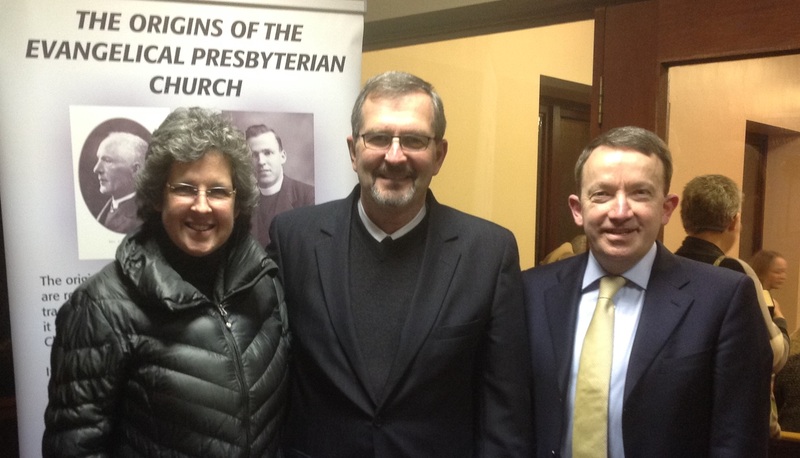 Alan and Joan Cairns and Rev. Stanley and Ina Barnes. Both Rev. Cairns and Rev. Barnes have a lifetime of ministerial experience behind them (both ordained in the 1960s), so I took the liberty to ask them a number of questions about the past revival they went through in their denomination (the FP) in the mid-1960s, about what was most important in the ministry as they looked back, and about how it felt now to be “retired” without a congregation, though both men maintain an itinerate ministry. I wish I had taped some of their memorable answers. Both men stressed how unworthy they were to be ministers of the gospel and yet what a privilege it was to serve the Lord Christ. 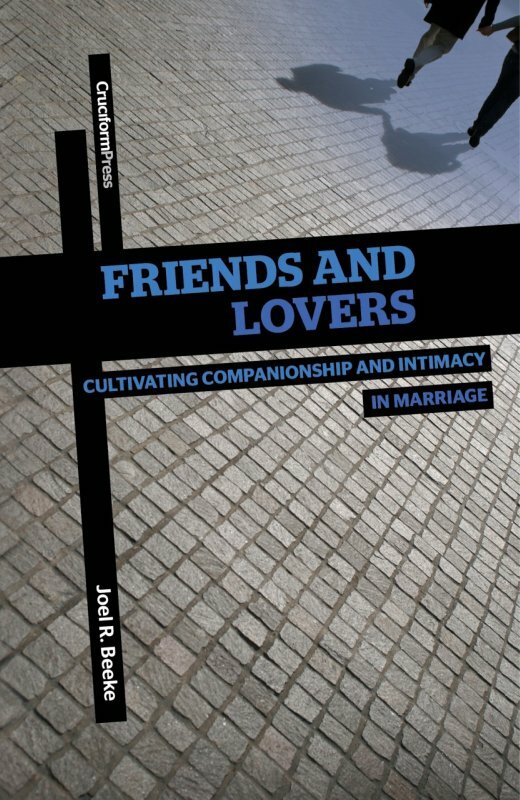 They both miss full-time ministry immensely—as do their loving, faithful spouses. (Meanwhile, Mary was asking them similar questions about being ministers’ wives for several decades!) I was particularly impressed with a lengthy answer that Rev. Barnes gave stressing the importance of magnifying the loftiness of the ministry. I again felt how much we have in common with these FP ministers. I spoke three times on Saturday, February 8, at the Whiteabbey Congregational Church to about 170 people at the Puritan Conference: The Puritan Theology of Worship; William Gouge on Living in the Family; Practical Lessons from the Puritans for Today. 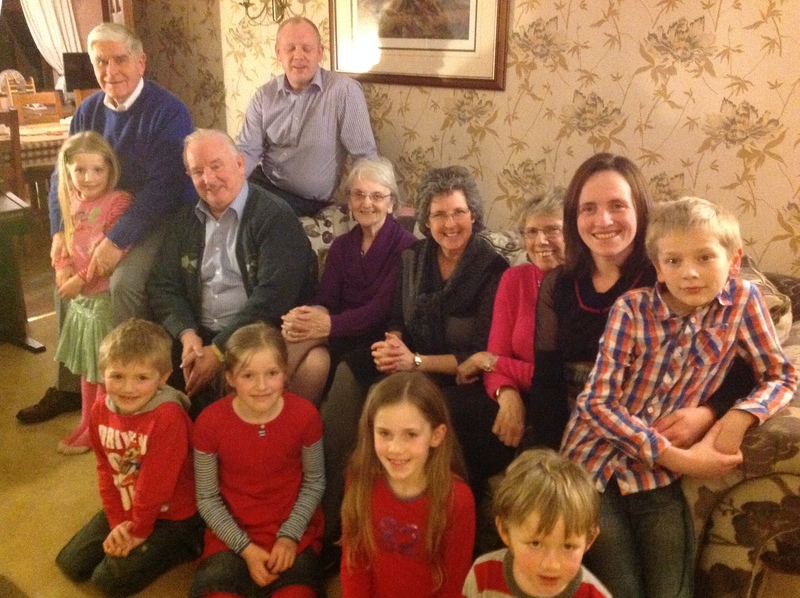 That evening we spent some time relaxing with the Dowling family and their precious children. After playing hide-and-seek with the children, Rebekah Dowling beat us all quite badly in a game of Monopoly, to our great sorrow. We are coming home soon—very bankrupt. On Sunday morning, I preached on Jesus’ tears at the Belfast Mount Merrion FP Church for Rev. Paul Dowling. We then were taken to our very good friends, Rev. 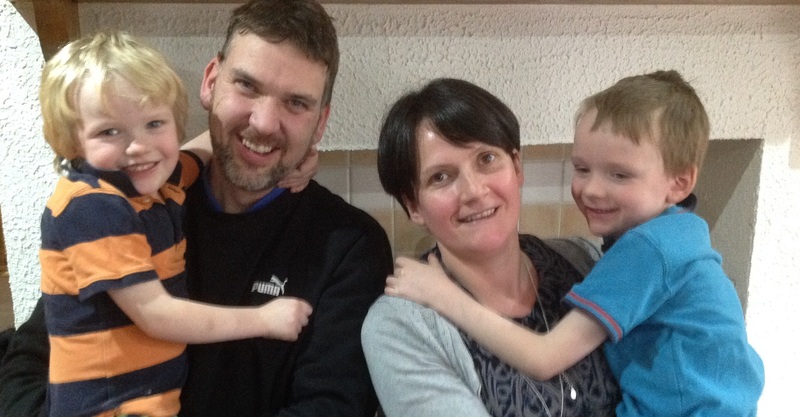 Andrew and Joan Woolsey, to have lunch in their Crumlin home, before driving to preach in the evening on Jesus’s Tears and Ours in Omagh Evangelical Presbyterian Church for Rev. Andrew Lucas, who has become a new friend. On Thursday I took a long walk with Mary to a neighboring village called Kells. Four men began to pray for revival in the mid-1850s in a house in this village. Revival broke out in 1859 in the neighboring village of Connor and spilled over into Kells, which required the building of the Kells Presbyterian Church. After touring Kells, Mary and I had some famous Irish fish-and-chips on a cold park bench. 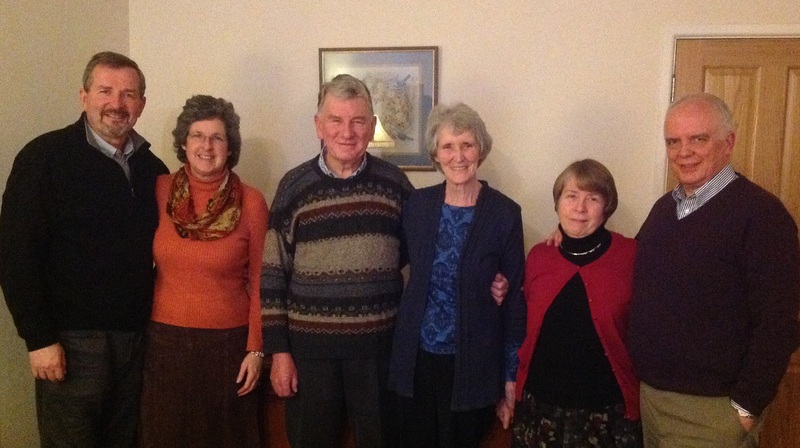 We then went to visit our special friends, Pastor Ted and Lorna Donnelly, and had the serendipitous experience of meeting Pastor Ian and Joan Hamilton—also dear friends—at the Donnelly home. Pastor Donnelly is suffering from prostate cancer, abdominal pain, and occasional brain seizures. He has amazingly recovered from encephalitis. We were delighted with how well he looked and how engaging he was in conversation in every way. We had a wonderful time of fellowship and prayer together. In the evening I preached on Simeon’s Spirit-worked hope at the Kellswater Reformed Presbyterian Church, the oldest Reformed Presbyterian church in No. Ireland, where Rev. John Coates now serves as a young, dedicated pastor. The church was organized in 1760, and the present immaculate church building replaced the original meeting house in 1806. 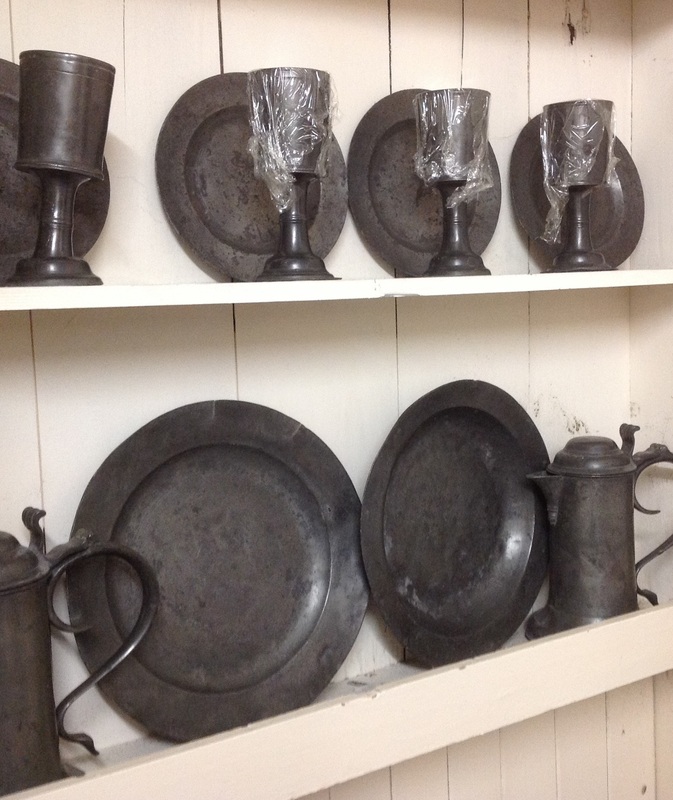 Pastor Coates showed me some of the old pictures of ministers and assemblies in the consistory room, including the old cups and plates dating from 1806 that are still being used today in serving Communion. The adjacent graveyard was nearly as impressive as the building. Some of the former ministers, who served the church for decades, are buried here. Mary and I had a good overnight trip to Northern Ireland on February 3. I was able to edit Paul Washer’s third volume that Reformation Heritage Books is publishing—the final volume in his series on the gospel. This volume is on gospel assurance and gospel warnings—and it may well be the best of the three. I really appreciate his emphasis on the assuring marks of grace as expounded by the apostle John in his first epistle. 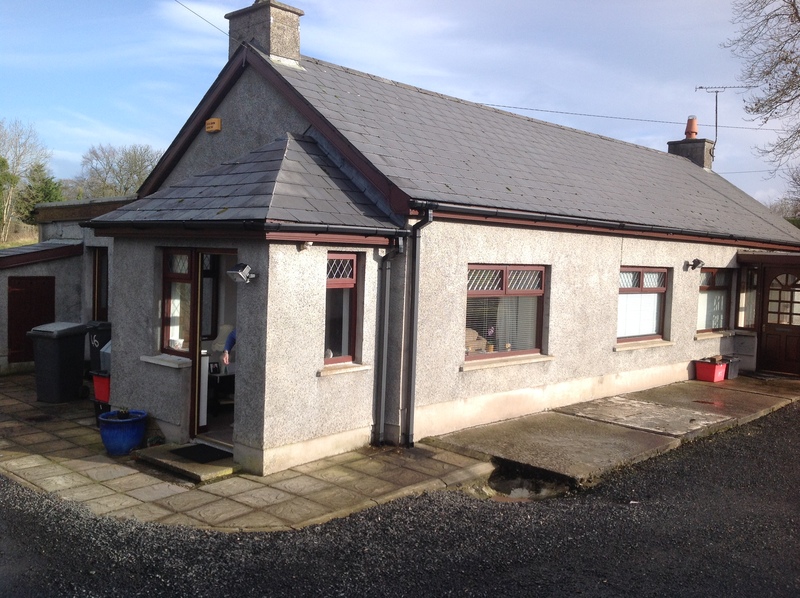 By Tuesday noon we were settled into the beautiful country home of Pastor Paul and Rebekah Dowling in Ballymena, Northern Ireland. What a delight this homeschooling family is! We enjoyed our time also with their children: Samuel (12), Hannah (11), Bethany (9), and Cherith (8). Tuesday evening I spoke on “Practical Ways for Overcoming Worldliness Every Day” to a variety of people from several church backgrounds. The meeting was held at the Bangor Free Methodist Church, pastored by Jeremy Forsyth, who, together with some of his people, have taken a keen interest in Puritan writings. On Wednesday we slept in, making up for a lost night on the plane, and then worked for several hours to prepare for my messages and catch up on e-mail. In the afternoon, I had a great visit with Rev. John Greer, moderator of the Free Presbyterian Church of Northern Ireland, and pastor of the denomination’s largest church. We resonate well on every issue we discuss; this dear brother is as thoroughly Reformed, conservative, and experiential as our ministers and churches are. He is a great gift to the FP churches of Northern Ireland. 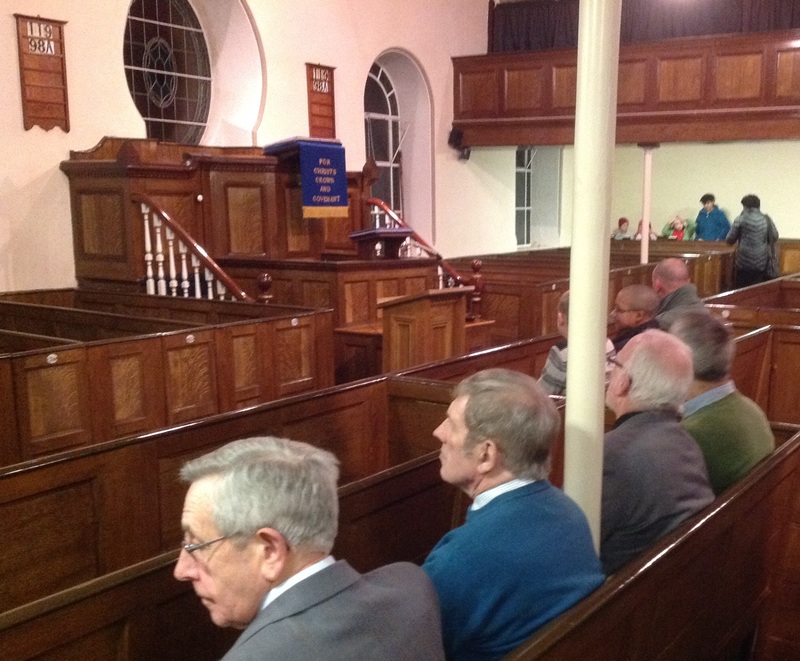 In the evening, I preached on Gethsemane’s King-Lamb for the Loughbrickland Reformed Presbyterian Church, which has been pastored faithfully by Rev. David Silversides for the last 25 years. 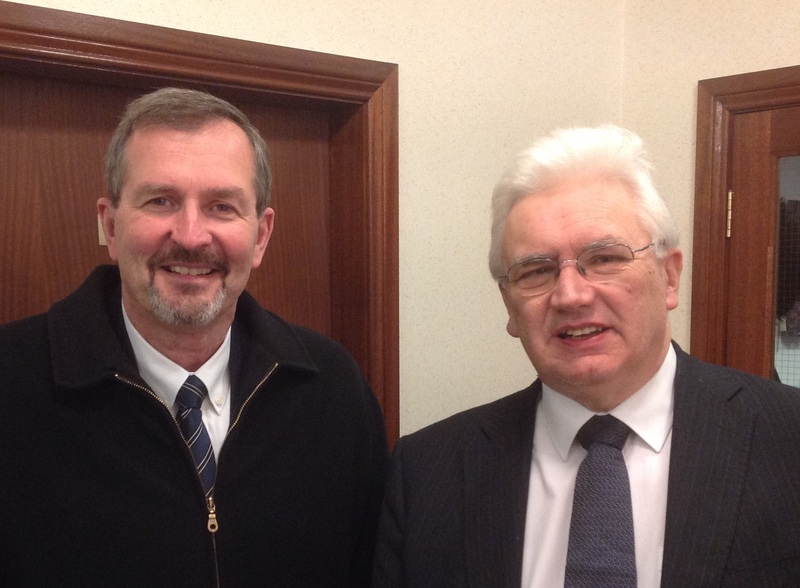 Brother Silversides is another Northern Ireland pastor whose friendship I have grown to appreciate in recent years. He is one of a rare breed of ministers in our day who truly magnifies the ministerial office as one of divine dignity.